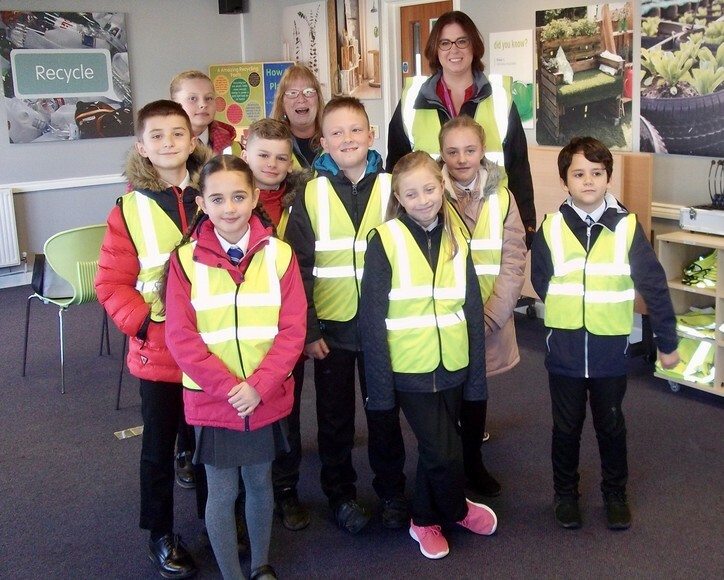 On Thursday 29th November, the Student Council of St Stephen Churchtown Academy invited the Aspire Health & Safety Team on an educational visit to The Materials Recycling Facility at Bodmin, and the Cornwall Energy Recovery Centre at St Dennis, run by Suez. Waste reduction and reducing the plastic waste in our oceans is something the Student Council is passionate about and the children were keen to study a variety of effective ways they can truly make a difference. As a Trust, our H&S team - Julie Brooks and Sian Valentine - are committed to considering ways of engaging, and embedding, a culture of Reduce – Reuse – Recycle & Recover, amongst all staff and pupils. The educational visit proved fascinating visit and the Student Council learned a great deal about the process of waste in Cornwall. The day, branded 'epic' by young and old alike, included interactive and fun educational activities including a tour of both facilities. The children even had time to get creative and produce something useful from a plastic milk bottle – check out the photos below in the gallery! A tour of the facilities at Bodmin and St Dennis can be undertaken by any of our academies and Suez will provide a full tour and transportation free of charge. Please contact either Julie or Sian for more details.